In June 2016 the ‘Sentiment Cocoon’ won MAb16 award a prestigious international award for Media Architecture in the category Participatory Architecture & Urban Interaction. The Media Architecture Awards are biannually given to outstanding projects at the intersection of architecture, media and interaction design. The installation was commission to be displayed at Vivid Sydney from 27 May to 18 June 2016. Vivid Sydney is a 23 day festival of light, music and ideas. 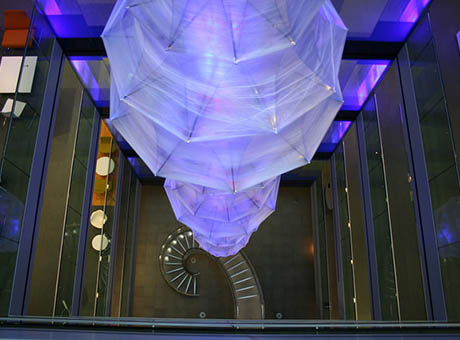 The ‘Sentiment Cocoon’ was originally designed for Arup’s headquarters in London and seeks to capture and express human sentiment through the medium of light. Simple interfaces allow participants to express in the public domain how they feel by how they touch. These interactions are then transformed into pulses of light that travel throughout the cocoon.